There's plenty of excellent pleasure cruising to be done in The Bahamas; the islands offer gorgeous waters and a seemingly endless array of uninhabited cays inaccessible by any other means (save swimming . . .). Even around the most popular islands you can drop anchor at some remote spot and enjoy sunny, silent swimming and snorkeling far from the shore. If you want someone else to do the sailing for you, cruise in a glassbottom boat during the day, dance under the stars on a dinner cruise, or charter a crewed boat for a couple of days of quiet and careless escape. 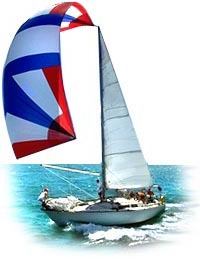 Competitive sailing, like competitive fishing, finds an ideal location in The Bahamas. Whether you're just watching or want to participate, a regatta is a beautiful and thrilling way to pass the day. Each major island holds its own regatta, usually in late summer; the best are to be found on Exuma, Long Island, Nassau/Paradise Island, and Freeport/Lucaya. The regattas tend to spawn parties, barbecues, and other congenial, inclusive gatherings--hang around a regatta long enough and you'll find yourself with ten new playmates by sundown. The Bahamas are also the site of quite a few noncompetitive sailing events, which bring boat enthusiasts and the just-curious together to bask in the warmth of camaraderie. Cost of a cruise permit is $10 and it is good for one year. After two years the boat must leave The Bahamas or be subject to duty and stamp taxes. Charges may include a nominal "transportation" fee if the Customs and Immigration officer has to drive to your location. If you arrive on a holiday, weekend or any time other than between 9 am and 5 pm on weekdays, you will be charged overtime. The amount may vary depending on the location, time of day and rank of inspecting officer. Overtime charges may be incurred after normal hours of operation. (Refer to The Bahamas 1994 Official Guide to Cruising, Fishing, Marinas & Resorts). Marine Towing & Salvage (Bahamas) Ltd.